I’m in northern CA so I must have done something right and put off procrastinating for a little while! 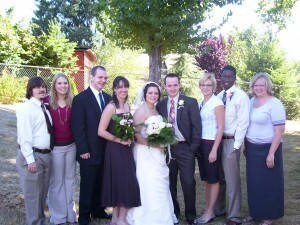 I had an excellent time in Eugene at Josh and Anna’s wedding. While the wedding festivities were wonderful, I think the best part was sitting around in the evenings with the Africa crew, reminiscing and enjoying being together for the first time in four years. So much has changed . . . they’re grown ups with marriages, jobs, fellowships, degrees, and a lot more experience living in the USA than they’ve ever had. The best news of all is that I really, really, really like who they’ve become and parting ways was harder than ever. It’s strange how the hard things are often the good ones. Sacramento the day after tomorrow and then LA on Sunday!